Governor Mike Pence wanted to run a campaign focused on Hoosiers. He enlisted the help of The Prosper Group to execute a fully in-depth digital strategy to achieve his goals. 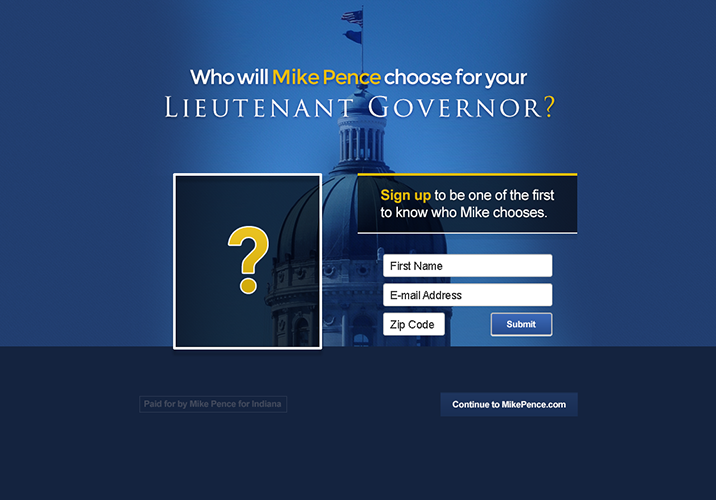 The Prosper Group revamped MikePence.com, turning it into a user-friendly, top-of-the-line website. The innovative, high-content website introduced voters to Gov. Pence as a person, and a politician. The revamped site also provided the campaign with a more agile tool to reach voters and to strengthen their efforts on the ground. Like any successful campaign, it was critical to build support and utilize it to grow and enthuse the volunteer base, donors and, of course, voters. Pence Corps, a volunteer initiative integrated with the campaign's day-to-day, used the combined power of the website and social media to increase their volunteer base and to engage voters with the campaign. In 2011, the Pence campaign was struggling to raise money online. With the help of the fundraising strategies employed by The Prosper Group in 2012, the campaign raised more in the first month than they had raised in the previous 12 months. In May 2012, The Prosper Group launched a teaser site for subscribers to find out about the Lieutenant Governor announcement. The site helped the campaign grow their email list and build momentum around the announcement. Holding true to Mike’s focus on improving the lives of all Hoosiers, The Prosper Group launched RoadmapforIndiana.com. This informative site about Mike’s vision for Indiana was frequently referenced on the trail and in TV commercials, helping ensure Mike’s message was available to every voter. In the end, his campaign was victorious on Election Day, with Mike Pence being elected the 50th Governor of Indiana.